This study is based on a non-representative, national level survey sample whose main purpose is to interpret the general population’s understanding of climate change. The study also provides an examination of correlations between climate change concerns and the taking of individual action as well as the relationship between pro-environmental thinking and climate change scepticism. Our results show a moderate correlation between the general population’s concerns and the professional views on the subject, known in the literature as the New Environmental Paradigm scale and Scepticism scale, but a significantly weaker correlation when it comes to taking action against climate change. Factors relating to the respondents, such as residence settlement type, education level, gender, age, personal and social values, or casual attributions in relation to climate change heavily influence this weaker correlation. Most respondents assessed climate change as a current (urgent), but geographically remote phenomenon. This is a clear indication of problems associated with cognitive conceptualization and the localization of climate change in communication. The target audience must be taken into account when designing climate change communications because interpretations of climate change can vary widely and cover a broad range attitudes ranging from concern about to issue all the way to climate change scepticism. This also applies to views concerning responsibility for climate change with some believing it is a political responsibility and others believing it is a scientific responsibility. Antal, Z.L. 2015. Klímaparadoxonok (Climate paradoxons). Budapest, L'Harmattan Kiadó. Bajmóczy, P., Boros, L., Csatári, B., Dudás, R., Farkas, J.Zs., Juray, T., Kovács, Z. and Pál, V. 2012. Managing the socio-economic consequences of the climate change. In Review of climate change research program at the University of Szeged. Eds. : Rakonczai, J. and Ladányi, Zs., Szeged, University of Szeged, Institute of Geography and Geology, 105–120. Baranyai, N. and Varjú, V. 2015. A lakosság klímaváltozással kapcsolatos attitűdjének empirikus vizsgálata (Empirical study of citizens' attitude towards climate change). In Klímaváltozás – társadalom – gazdaság. Hosszú távú területi folyamatok és trendek Magyarországon. Eds. : Czirfusz, M., Hoyk, E. and Suvák, A., Pécs, Publikon Kiadó, 257–284. Bereczki, B.H. 2012. A klímaváltozás médiadiskurzusai (Media-discourses of climate change). Korunk 23. (2): 14–21. Bobvos, J., Málnási, T., Rudnai, T., Cserbik, D. and Páldy, A. 2017. The effect of climate change on heat-related excess mortality in Hungary at different area levels. Időjárás 121. (1): 43–62. Formádi, K. 2013. A klímaváltozás, mint kockázat érzékelése és a megoldásával kapcsolatos attitűdök szakirodalmi vizsgálata (Literature review of climate change: perception of risk and attitudes of solution). Iskolakultúra 12. 49–58. Jankó, F. 2015. Éghajlatváltozással kapcsolatos tudás a világháló magyar részén (Climate change knowledge on the Hungarian web). Tér és Társadalom 29. (2): 67–89. Jankó, F., Móricz, N. and Papp-Vancsó, J. 2010. Klímaváltozás: tudományos viták és a társadalomföldrajz feladatai (Climate change: controversies in science and the objectives of human geography). Földrajzi Közlemények 134. (4): 405–418. Jankó, F., Móricz, N. and Papp-Vancsó, J. 2011. Klímaváltozás: diskurzusok a katasztrófától a kételkedésig (Climate change: discourses from catastro- phe to scepticism). Földrajzi Közlemények 135. (1): 3–16. Kajner, P., Czira, T., Selmeczi, P. and Sütő, A. 2017. National Adaptation Geo-information System in climate. Időjárás 121. (4): 345–370. Mesterházy, I., Mészáros, R. and Pongrácz, R. 2014. The effects of climate change on grape production in Hungary. Időjárás 118. (3): 193–206. Mosoni-Fried, J., Pálinkó, É. and Stefán, E. 2008. Klímaváltozás a közvélemény-kutatások tükrében (Climate change in public opinion polls). Klíma-21 füzetek 49. 45–58. Salamin, G., Kohán, Z., Dobozi, E. and Péti, M. 2011. Climate-friendly cities: a handbook on the tasks and possibilities of European cities in relation to climate change. Budapest, Ministry of Interior – VÁTI. Szirmai, V., Molnár, B., Szépvölgyi, Á., Schuchmann, J. and Váradi, Zs. 2008. 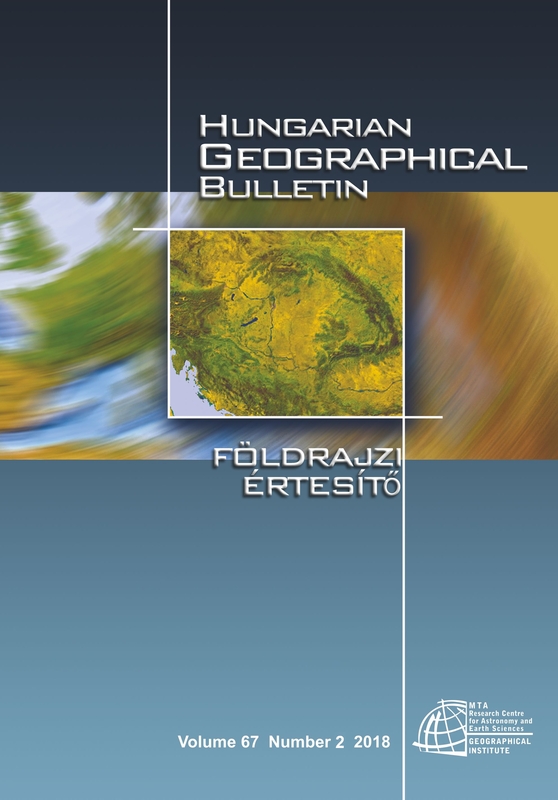 A klímaváltozás térbeli hatásai a budapesti társadalomban (Regional effects of climate change in the society of Budapest). Klíma-21 füzetek 54. 51–71. TÁRKI 2007. Klímaváltozás a nyilvánosságban (Climate change in public discourse). Társadalmi Klíma Riport 1. Budapest, TÁRKI Image Factory. Accessed: 11.01. 2017. TNS 2009. Europeans' attitudes towards climate change. Special Eurobarometer 313. TNS Opinion & Social, European Parliament and European Commission. Accessed: 11.12. 2017. TNS 2011. Climate change. Special Eurobarometer 372. TNS Opinion & Social, European Commission. Accessed: 11.12. 2017. TNS 2014. Climate change. Special Eurobarometer 409. TNS Opinion & Social, European Commission. Accessed: 11.12. 2017. TNS 2017. Climate change. Special Eurobarometer 459. TNS Opinion & Social, European Commission. Accessed: 11.12. 2017. Older issues (back to 2009) are also open-access available via Publisher's website.